Take a virtual tour of one of our base camps, click on the VR 360° image above and pan around, on some mobile devices such as iPhones you can physically orient your phone to look around as if you were really there. Whether you need to relax from the heat of battle, or are waiting around for your troops to come back from combat, you can wait in comfort in our safe, comfortable and well equipped M*A*S*H style base camp. Snacks and refreshments are available for purchase from the kiosk. 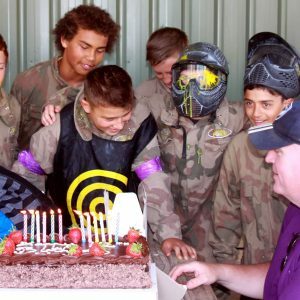 The Delta Force Paintball base camp will be your headquarters for the day. This is where you leave your valuables, get your gear to transform you from a civilian to a sniper, enjoy breaks between games and talk special ops tactics for your next mission. The base camp has flushing toilets operating on mains water, covered seating picnic areas as well as lockers available (for a nominal hire charge) for the safe storage of car keys, mobile phones, wallets, jackets, paintballs and so on.